Treat someone special to one of our wine tasting experiences! ThirtyFifty wine tasting vouchers make fab Christmas or birthday gift experiences for wine loving friends & family and can be redeemed against our wine tasting events in London, Bristol, Cardiff, Liverpool, Leeds, Leicester, Manchester, Sheffield, Norwich and Birmingham. Many of those who receive a voucher often like to share the experience with someone, so do consider booking yourself a place at the same time! Our Wine Tasting Evening Vouchers and Champagne & Sparkling Wine Tasting Evening Vouchers are £39 per person at selected locations. Our London Supper Club Wine Tastings are £49 each. All vouchers are valid for 24 months and can be emailed free of charge or we can post a printed voucher in a smart purple envelope for an additional charge of £2, allow 2-4 days for delivery. Order online or call us on 020 8288 0314 and we'll be happy to help! Our One Day Wine Course Vouchers are £89 per person for London, Bristol, Cardiff, Buckinghamshire and Cheshire include 16 wines and include a delicious three course lunch. We also have a Champagne & Sparkling Wine Tasting and Lunch in London at £89pp with 10 sparkling wines and a 3 course lunch. Both make a perfect day experience for wine lovers. Voucher will be posted up until Saturday 22nd December 2018. Email vouchers will be emailed automatically once you have completed your purchase online. Not sure which of our wine tastings to choose, or want to treat your family to a wine tasting at home, why not purchase our £50 or £100 Gift Vouchers. These vouchers can be used towards any of our wine tastings or to purchase wine from our online shop, as full or part-payment and are valid for 24 months. Our wine tastings at home are priced from £30 per person with a minimum of 10 people. Once in receipt of the vouchers all that's needed is to contact us to set a date. Vouchers are emailed free of charge or for an additional £1 we can send a printed voucher by post. Please allow 2-4 days for delivery. 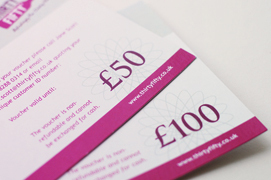 ThirtyFifty £50 Gift Voucher. To spend on wine or to redeem against a ThirtyFifty Wine Tasting. ThirtyFifty £100 Gift Voucher. To spend on wine or to redeem against a ThirtyFifty Wine Tasting. If you know which date you want to book we can send you a voucher for a specific date. For forthcoming dates for 2019 please visit One Day Wine Course, Wine Tasting Evenings or WSET courses. We're delighted to be recommended by Waitrose Drinks Magazine as Best for Beginners in their Christmas 2017 guide to the UK's best Wine Courses. Cheers! If you have any queries call us on 020 8288 0314 or email us (details on the voucher) quoting your Voucher Code. Our email vouchers are available in 3 different designs for Christmas, Birthdays or any special occasion!